Dan shuffles in. The man at the desk warns him against making so much noise. He doesn't want anymore calls. As Dan heads into 308, his nosy neighbor complains about all his noise as well. He passes an oldman in his wheelchair. Paranoid Dan scopes out his room, and nails chains against his windows. He's jumpy, thinking he heard something, but there's nothing in the closet. He heads to bed, with his hammer snuggled up to him like a teddy bear. As he sleeps something gasses him, paralyzing him. He watches in fear as some neon mouth monster's jaws open to devour him. Nick creeps past Eve into the tunnel. Eve isn't sleeping though. Nick takes pictures of Eve's wall art as she joins him. There are a lot of carvings on the walls, and Diana was able to see more on the cloth. They both wonder if the Grimms who buried the stick knew what they really had. Dan awakens, freaked out. His room is still fully barred, but something obviously got in. Not fully dressed, Dan continues his freak out in the streets. A man stops him, thinking that he's a homeless man. He offers to take him to the shelter so he can get some rest. Dan mistakes him for the monster and beats the man senseless. Monroe and Rosalee try to assist with translating the symbols. They all know that it means something, but its a hodgepodge of many ancient languages. Monroe finds a symbol that he recognizes. It all leads to sevens. Seven stars, seven grimms, seven keys. Rosalee reminisces that she always wished on stars as a kid, for a better life, and the last wish came true. There's an awkward moment for Nick and Eve, as they get mushy. Nick updates Hank about their single symbol, when they get the call about the unfortunate incident. Michael sounded like a pretty good Samaritan until he ran into the crazy man. Luckily they get a lead on Dan. Hank and Nick head straight up to 308, shutting up the nosy neighbor along the way. Dan continues to hammer away, refusing to open the door for Nick and Hank. He's afraid something will come and get him, and not let him sleep. Hank and Nick break down the door, as Dan wails. Hank is hoping that its all mental, but they both know better. Nick looks for the reason, as creepy wheelchair man just sits and watches. The guy at the front desk claims to not know anyone in the hotel all too well. He alludes to Dan being a good tenant until he maybe started taking drugs. He gives Nick and Hank his previous address, and he's not exactly happy to hear that Dan nailed all the windows shut. Nick asks about the wheelchair man, but he doesn't get much. The man isn't very social. Captain Renard shuffles papers around his office. He hears a noise and assumes that Meisner is around. He doesn't exactly want to play with ghosts. Renard gets a visit. Black Claw isn't exactly happy with him. Everyone is dead, as is Renard's political career. He plans to put them back on course. Black Claw is having a little bit of a hard time understanding things. 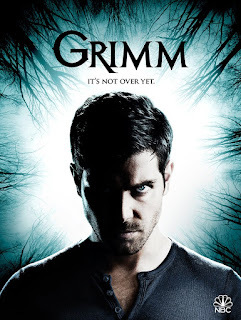 Renard was suppose to have the Grimm handled, but he didn't. Renard has had enough. He's done with the conversation, and he's done with Black Claw. Monroe, Rosalee and Eve continue their digging. With the first symbol translated to be a constellation, its possible that more of them are as well. The whole thing may be a map of the universe. Hank gets an update on Dan. He's been living off welfare for awhile. They put the clues together, and it just be a breakdown from encountering wesen. Hank and Nick go to talk to Dan. He describes what's been visiting him at night. As he recounts his nighttime visitor he begins to freak out. Nick and Hank try to calm with no luck. Hank is finally forced to knock Dan out before he hurts them or himself. Monroe thinks he has a piece of the sumarian calendar. Whereas Rosalee has found a piece of the Mayan calendar. Eve is confused how they're connected. Nick arrives for an update. They think that its mapping out an event in the past, where the stick may have come from. Hank and Nick actually came for some Wesen guidance. Nick describes what is happening to Dan. It sounds like an Alpe. Alpe steal dreams to keep from going crazy. If they feed too many consecutive times on the same victim, then the victim begins to go crazy. Hank and Nick look into the guests of the hotel. It seems that the Alpe has been using the hotel as a hunting ground for a long time. Nick calls the hotel owner, but she doesn't know much about the hotel. She inherited it, and she doesn't know much about the managers as well. She wasn't much help. Dan's room was a fortress, which begs the question, how did the thing get into his room. Nosy neighbor is about to get an unwelcome visit. He blows his gas at her, and climbs on to feed. Meisner sits in the hallway to visit with Renard. He's not there to haunt him this time, and cautions Renard not to talk to him in the hallway where no one else can see him. Meisner warns Renard that Black Claw is planning on killing him. He shows him the ambush, and Renard takes out the two would be assassins. Renard questions Meisner's actions. This time Renard chose the right side. Renard wonders if they're done, but Meisner doesn't give an concrete answer. The nosy one falls to the ground, in an absolute panic, and falls down the stairs. The manager isn't sure why the cops have arrived. The woman fell around six in the morning. She's clearly not dressed to go out, but its a hotel and odd things happen there. Nick and Hank check the room. Windows are locked, and there's no signs of forced entry. Nick wants to catch the Alpe in the act. Nick and Hank go to Monroe with their plan. They want him to go undercover, so they can catch the Alpe. Rosalee isn't happy about the plan, but with Nick and Hank promising to pounce at the first sign of danger, she agrees to help. She pulls out a very big needle to give Monroe the giant dose of melatonin he'll need to make him appetizing. A very sleepy Monroe is given quick instructions on how to set up the room, and prepare to be bait. He checks into room 305 and prepares the room. It isn't the cleanest of rooms, nor is it the most comfortable, but Monroe is quickly out anyways. Nick and Hank prepare for a long stakeout, but its not long after the front desk guy locks up that Nick spots someone in Monroe's room. Nick and Hank run to the rescue as Monroe gets gassed. The Alpe crawls on top of a paralyzed Monroe. Hank shoots open the door, but when they arrive there's no Alpe in the room. It knocked over camera, and they find a hidden passage behind the dresser. Even though Monroe is still paralyzed they have no choice but to give chase. Nick and Hank chase after the Alpe, but find that the manager is a hunjeiger. Monroe, finally up tells them that it was definitely an Alpe, so the trio run into another passage after the Alpe. It leads them to the nicest welfare hotel, which is definitely not a welfare hotel. The hotel owner is an Alpe. She volgs in front of Nick, and gets a little cocky. She doesn't think that Nick can do anything to him, not legally. He tells her she has two choices. To sell the hotel, leave town, and donate all the money to the homeless. She scoffs at the idea. The other choice is that he's a Grimm, and no one will miss an Alpe. Nick hands off his police affiliated items to Hank, and she quickly agrees to sell. Before Nick and the others can leave, she volgs and springs to attack Nick, but he's faster and pushes her aside, right into a table. She's killed instantly, and no one is remorseful. Rosalee and Eve continue to work with the symbols, to find when the constellations could have been aligned as they are in the drawings. Rosalee can't find anything in the past, but she does find something in the future. March 24th to be exact.